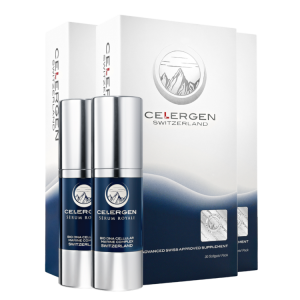 Celergen’s Swiss BIO DNA Cellular Regeneration Serum is a powerful, nutrient rich formula that transforms your skin, by visibly improving hydration, firmness, wrinkles, elasticity, lines, age spots and the presence of pores. Our proprietary formula repairs and renews at the cellular level, boosts natural collagen synthesis and reverses the aging process where it begins. This potent, BIO DNA marine cell and anti-oxidant infused serum enhances our skin’s own defense system, while activating our natural ability to stave off stressors and UV damage as it did when we were younger. As natural anti-oxidants are awakened, this healing serum will restore and energize your skin as never before. Dramatically firm, tighten and smooth skin’s appearance while significantly reducing the look of lines and wrinkles on the face, under the eyes, hands, neck and décolleté. Triggers cell renewal to rejuvenate skin’s natural radiance, hydration and luminosity. Strengthens skin and dramatically increases density and elasticity, returning fullness, firmness and tone. Deeply hydrate to reduce redness due to dry skin. Improves softness and suppleness and gives skin an immediate glow. Improves skin tone and reduces age spots and discolorations, leaving skin illuminated. Our BIO DNA CELLULAR MARINE COMPLEX is a natural macromolecule that provides vital nutrition to damaged cells. It is extracted from the DNA of deep sea salmon and herring, living off the waters of coastal France. This proprietary cold extraction technology prevents the depolymerization of the active ingredients, ensuring the effectiveness of both Celergen and Serum Royale. This proprietary formula activates skin cell repair and delays the signs of aging. This breakthrough marine complex significantly increases the ability of skin cells to repair themselves and enhances the skin’s natural defense system. The anti-oxidant properties of the BIO DNA Cellular Marine Complex nourishes and enriches our complexion, keeping it illuminated, hydrated and glowing. Your skin will thank you. Celergen and Serum Royale contain the exclusive Peptide E Collagen which offers the secret of cellular longevity for the most demanding skin. Day after day, your skin regains its strength and the shape of your face is gradually redefined, while wrinkles and fine lines disappear. Peptide E Collagen effectively delivers collagen and elastin producing peptides directly to damaged cells which reinforces skin elasticity, increases hydration, hair thickness, and strengthens nails. Keep at room temperature. Avoid direct exposure to sunlight. For external use only. Avoid contact with eyes. If contact occurs, rinse eyes thoroughly with water. Discontinue use if signs of irritation or rash occur. If irritation or rash persists, consult a doctor. Keep out of the reach of children. FDA DISCLAIMER - These statements have not been evaluated by the Food and Drug Administration. This product is not intended to diagnose, treat, cure, or prevent any disease. You should consult a licensed health care professional before starting any supplement, dietary, or exercise program, especially if you are pregnant or have any pre-existing injuries or medical conditions. The content of this website has been prepared by Celergen SA, Luxembourg for informational purposes only. Any prior results or testimonials described on this website do not guarantee a similar outcome. © Celergen SA, Luxembourg. All Rights Reserved.